Sandra Palmer from Stanthorpe, QLD, writes ..
We were very fortunate to have Dexter join our equine family 14 years ago. We have tried different methods over the years to stop his seedy toe from reoccurring in his front hooves. Every time we thought the seedy toe was almost gone it would worsen again. Very frustrating as many horse owners can relate to. For many years Victoria has been a god send for my horses (and my sanity) through sharing her professional knowledge and experience whenever I needed to pick up the phone. Last year I mentioned Dexter’s seedy toe to Victoria whilst speaking to her about another horse of mine. She said she had developed a new remedy, that she had formulated and trialled on her 26 year old gelding, Harry, with great results. She named the remedy after him! 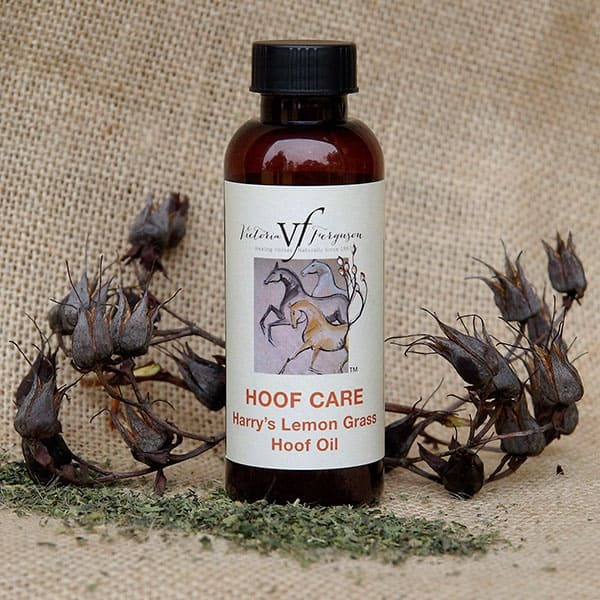 Victoria sent me a bottle of Harry’s Lemon Grass Hoof Oil with strict instructions to apply the advised amount DAILY or the results would not be seen. To cut a long story short, after two months I can say Dexter’s seedy toe has now gone. I would definitely recommend Harry’s Lemon Grass Hoof oil to anyone who is in the same situation. Daily application does really make a difference.